When the weather turns warm, I love to start wearing dresses. I especially like t-shirt dresses for their comfort and versatility. You can dress them up or down depending on the shoes and accessories you pair with it. 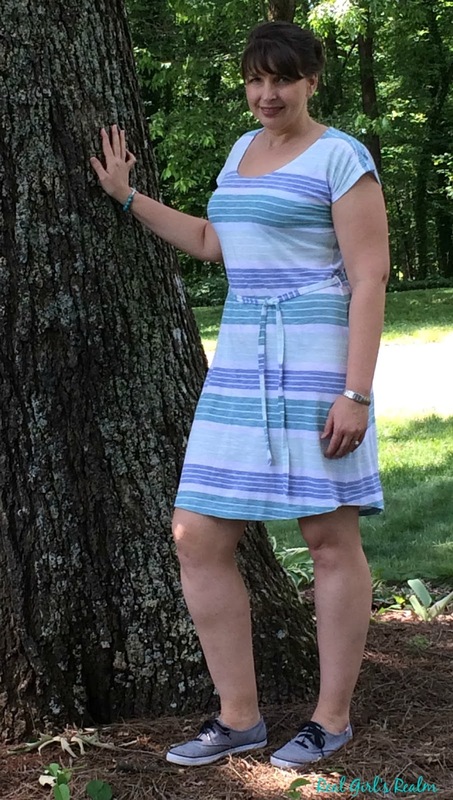 I am wearing the Atherton Dress in Blue Turquoise from Aventura Clothing, which is made of 100% cotton. Although I love wearing t-shirt dresses, they are not always the most flattering, but this one has a skinny tie belt which adds shape and the hem detail gives it a unique look. For the first look, I kept it simple and sporty and paired the dress with a pair of black chambray keds. For the second look, I paired it with a white bubble necklace and strappy white sandals to make it appropriate for work or a casual lunch date with the girls. I added a turquoise lightweight jacket, perfect for cool evenings. I like that it is made of cotton and a lighter weight than my denim jackets. Lastly, I dressed it up with a scarf, turquoise bracelet, cute clutch, and high heeled cork wedges. If you want to try Aventura, use my code RealGirls20 for 20% off a one-time shopping purchase from AventuraClothing.com and can be used for both Aventura and Ecōths clothing – even sale items! Which look is your favorite? Check out my other outfits too! I received these items for free, as part of my Brand Ambassador contract, but all opinions are my own. Its my fave layering piece this year! Thanks Ash! Thanks Bethany! I love this look too! Tshirt dresses are my go-to in summer! Love the pretty colors in this one. The jacket you used goes with it perfectly! Thanks Laura! I could live in t-shirt dresses too! Perfect summer dress, Mary! The stripes and colors look great on you. I always enjoy seeing the different ways you style one piece. Your turquoise jacket was simply perfect for this dress. 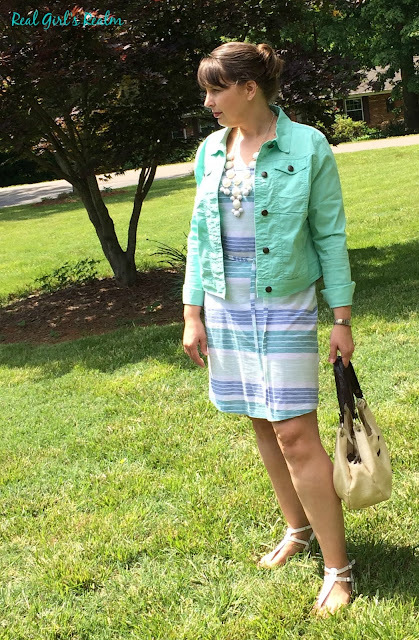 Come join us today and share on The Ageless Style link-up! Thanks Jennie! You are too kind! I love anything with stripes! I will definitely pop over there! Ohh, love it with the gorgeous and bright jacket!! Stripes are my jam right now! Yes! I have a thing for stripes too! cute dress.Thanks for linking up to Ageless Style. I hope you can join the Top of the World Style party on Thursday as well. Thanks for visiting and having me at Ageless Style! I will check it out! Your tee shirt dress is so cute! 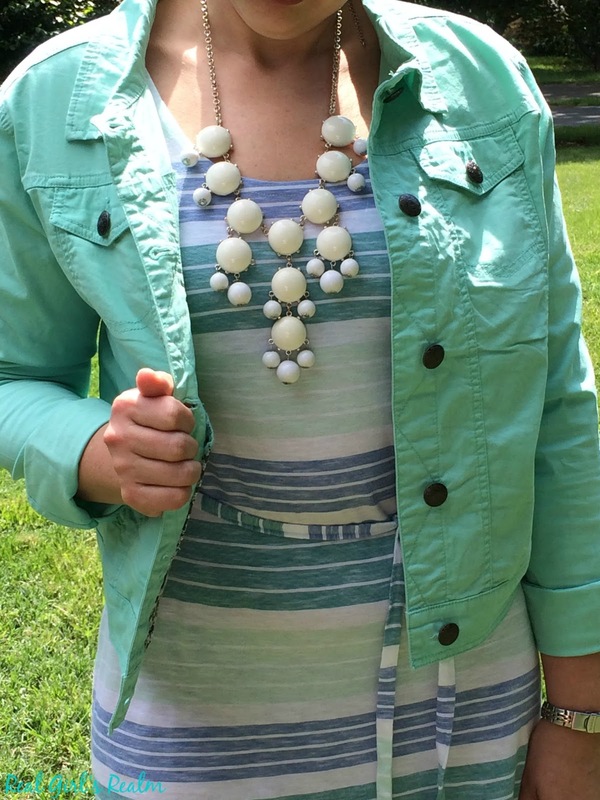 Love the stripes and your mint jacket! Thanks Jill! I believe this will be a summer favorite! Thank you so much! It goes with so much more than I expected. I really like the addition of the jacket! I agree! It dresses it up! Well done on styling this lovely summer tshirt dress, Mary! Love it on you so much <3 Love the way you tie your scarf around your neck, really fab! Also, that jacket & accessories go so beautifully with it! Thanks so much Nadia! 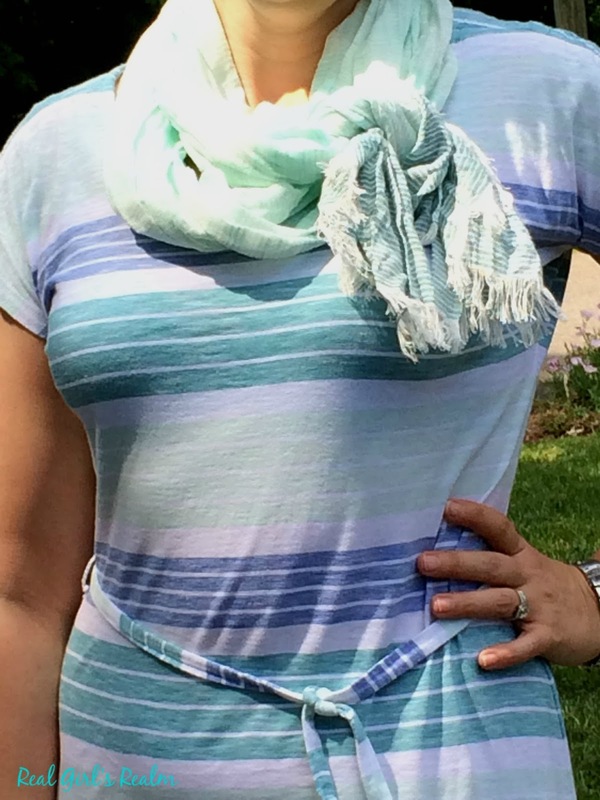 I love accessorizing with scarves because there are so many possibilities! This dress is adorable. I love the striped pattern and the colors. And I love all three ways that you have styled it. Tee shirt dresses are my go-to for summer as well because of their ease and versatility! Thank you! I wish I could live in T-shirt dresses too! 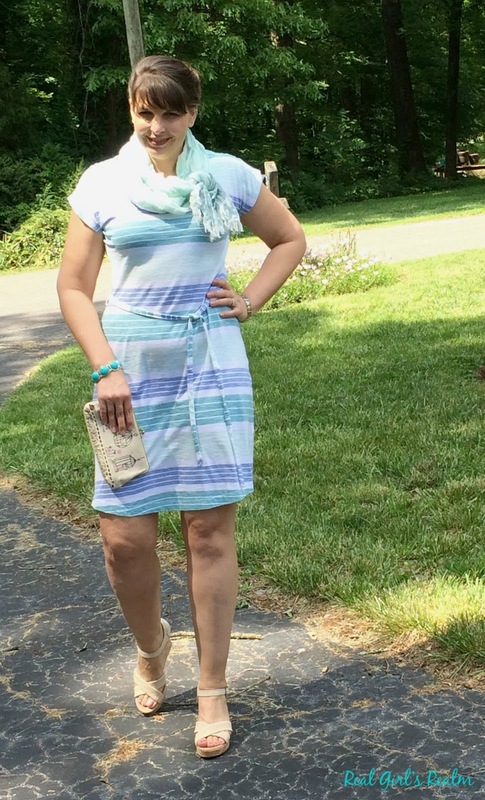 I have never seen a striped tee dress in pastel blue colors but I love it. I think the look with the scarf is my favorite thought the middle one with the bubble necklace is a close second. I am intrested on the Aventura clothing. Can you tell me more about them? Also, come join me this Thursday and every Thursday for my linkup, dear. Thanks Mary and have a great rest of the week! I am down with anything striped so I had to get this one! Aventura clothing is a family owned business and they carry eco-friendly clothing. I will email you a discount code and the website so you can check them out! I will be linking up with you tomorrow too!